eat, drink & be vegan: Thora Thinks You Should Buy This Book (and so do I)! Thora Thinks You Should Buy This Book (and so do I)! Last week I received a review copy of a new book. Not a cookbook, but a children's book. It is called Garlic-Onion-Beet-Spinach-Mango-Carrot-Grapefruit Juice. Now that's a mouthful! Sound good... want some? Well, if you're one of Nathalie VanBalen's characters, you will! In fact, you will find juicing so energizing and exciting that you come up with new creations everyday... and juicing will get you TOTALLY... TOTALLY... PUMPED! Nathalie's book is narrated by "Ingvar" the finger (love that), and introduces you to five characters that live together, Thora (the thinker), her little wee friends Zwee and Geep, and two Vikings (Aksel and Krog). 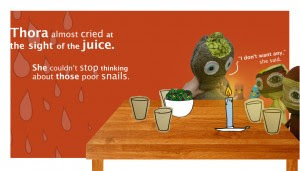 Aksel and Krog are juicing enthusiasts, who discover on the internet one day that yellow spotted snail shells have been touted as the new nutrient-rich power food, guaranteed to deliver protein and get you 'in the zone'. When Thora discovers that Aksel and Krog have gathered up nets full of these snails, she thinks and thinks about this decision and how the snails must feel... what will happen next? Nathalie is a gifted artist. 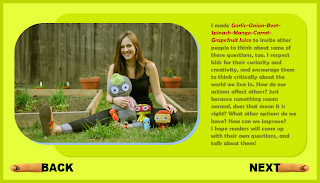 She has written and self-published and promoted this book, and has even designed and hand-crafted the quirky, yet lovable, characters. I am so impressed with this book and Nathalie's talent. She successfully communicates an incredibly important message without explicitly stating it, giving the reader the opportunity to empathize with the characters and pause to think about the impact of our food choices. Not to mention that this book is just plain clever and fresh! The first day I read the book three or four times. Each time I noticed something new, a creative detail like where words were placed, or an expression on a character that you didn't notice before. Some pages give more through illustration that communicates the message than through the written words, such as after Thora discovers the vikings have collected yellow spotted snails to use their shells in juice. With that realization, the next page opens as if you are looking into Thora's heart and brain, knowing this event is causing Thora to think, and feel sadness. These kind of nuances in the book are brilliant. Also, Nathalie includes phrases and references for your kids that keep the book very current, and will have your kids giggling. Like how the vikings get "TOTALLY PUMPED" with juicing. 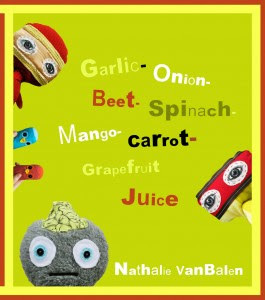 And, I think this might be the first children's book to use the word "kale" in a positive context. Enthusiastic, actually! Where else might you read... "Check it out! I just got 15 bunches of kale!" "Awesome, man. Let's eat tons of it". "Mega-tons." The book is recommended for ages 6 and older, and I agree that children under 5 or 6 may not connect as readily with the humor and messages in the book. Our middle daughter is 5 1/2, and was fully engaged with the book, giggling through the funny moments, and empathizing with the snails and wondering what might happen, and then feeling such joy again. Our daughter who is 9, looked at me with big eyes when we finished reading and said "I LOVE this book". She is an avid reader, and while she reads plenty of books, she has just a few that she really adores. With plenty of kids' birthday parties through the school year, and of course Christmas around the corner, why not support this young talent and buy some gifts that might just have some meaningful impact? The book is also hard cover, which gives it some durability and lasting power. I plan to buy quite a few copies myself, please support this young artist and get some copies yourself. Note: I have no interest in supporting Nathalie other than hoping to see this book succeed so she might write another! Thanks for this review. My copy is in the mail. I ordered it last week and can't wait for it to get here! My husband is a meat eater (as is everyone on both sides of our families), and I need all the help I can get to keep our future children on board with vegetarianism!